Spending our 2nd summer as Workampers at Pere Marquette Oaks RV Resort in “Baldwin” Michigan, we again had the opportunity every few days to explore the area of what northwest Michigan has to offer. We’ve been working 7 days on duty, then 7 days off duty sharing responsibilities with our Workamper co-workers Russ and Mary. 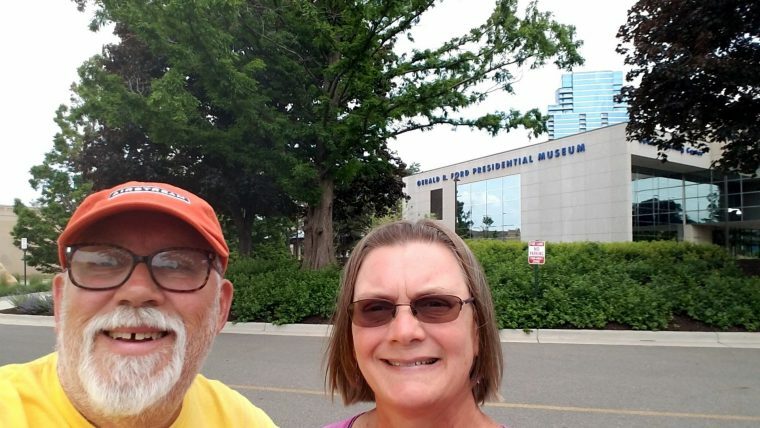 One day Kathy and I took a drive “down state” a little to Grand Rapids to visit the Gerald R. Ford Presidential Museum and Burial Site of he and his wife Betty. Gerald Rudolph Ford, Jr. was born on July 14, 1913. While Gerald Ford was still an infant, his parents were divorced, and his mother moved to Grand Rapids, Michigan, where she married Gerald R. Ford, Sr., who adopted the boy and gave him his name. After graduating from the University of Michigan (1935), where he was a star gridiron-football player, Ford worked as an assistant coach while he earned a law degree from Yale University (1941). He joined the navy during World War II and served in the South Pacific, attaining the rank of lieutenant commander and nearly losing his life in 1944 during a deadly typhoon that killed hundreds. In 1948, the year he won his first elective office, as Republican congressman from Michigan, he married Elizabeth Anne Bloomer (Betty Ford), with whom he had four children—three sons (Michael, John, and Steven) and one daughter (Susan). He served nearly 25 years as a Representative of Michigan’s 5th congressional district, eight of them as the Republican Minority Leader. Serving from 1973 to 1974 as the 40th Vice President of the United States, Ford was the first person appointed to the vice-presidency under the terms of the 25th Amendment. He then became President upon Richard Nixon’s resignation on August 9, 1974, and served until January 20, 1977 as the 38th President of the United States. The 44,000-square-foot two-story triangular museum is one of the highlights in a 20-acre park complex that includes the Grand Rapids Public Museum along the west bank of the Grand River in downtown Grand Rapids. There’s so much to see and so much to read in this museum. There are lots of typed and hand written letters on display, audio and video recordings of the early years and his time as the leader of our nation, along with an entire display room dedicated to Betty Ford and her contributions to the community, the presidency, and the nation. Definitely could go back and spend the better part of an entire day taking in all the museum has to offer. Living the full-time RV lifestyle presents us with the wonderful opportunity to see and experience so much that we wouldn’t otherwise have had available to us.